Omega: History, Models and Prices. New & Vintage. Discover the world of the Omega watches online. The Omega brand not only offers a collection of outstanding timepieces, but also offers a fascinating history to accompany them. Omega was founded in 1848 in La Chaux-de-Fonds when the 23-year-old Louis Brandt, decided to open a small watch business where watch components were to be assembled into finished products. Out of this small business grew a large manufacturer: In 1894, the famous 19-ligne pocket watch movement was developed and named ‘Omega’. Omega, as the final letter of the Greek alphabet, stands for the ultimate step in perfection. On the initiative of the then-president of Omega, the company entered into a collaboration with the S.S.I.H. (Société Suisse pour l’Industrie Horlogère) in 1930. Later, the Swatch Group developed out of this cooperation. Today, Omega is the flagship of this prestigious company. In 1932, Omega entered its partnership with the Olympics – a long-term collaboration that is still in place today. In 1969, Omega accompanied the first moon landing of Neil Armstrong and Buzz Aldrin with the Speedmaster, and this so-called ‘Moonwatch’ is still regarded as one of the most significant watches in history. In Los Angeles 1932, Omega was part of the Olympic Games for the first time as a partner company. They provided 30 stopwatches of the calibre 1130, which enabled accurate measurements to the tenth of a second. The secret: a fly-back hand for the measurement of interim times. With over 80 years of successful cooperation, Omega has contributed greatly to the development of accurate timekeeping in sports. Special edition collectors are always keeping an eye out for the extravagant ‘Olympic’ models by Omega, including the Seamaster Planet Ocean ‘Sochi 2014’ Limited Edition. Omega continues to maintain close ties to the world of sports outside of the Olympics as well: the company is a partner to renowned swimming contests like the FINA (Fédération Internationale de Natation) and the European Athletic Association (EAA). Omega can take pride in brand ambassadors as successful as Michael Phelps or Chad le Clos. Omega is also active in golf sports, as is clearly demonstrated by the Omega Seamaster Aqua Terra ‘Golf’. The year 1957 saw the launch of the Omega Speedmaster – a watch that would go down in history. In 1965, after a series of rigorous tests, NASA declared the Omega Speedmaster as the official wristwatch for astronauts. It was the first wristwatch to venture to the moon, where it arrived on July 20, 1969, together with Neil Armstrong and Buzz Aldrin. Since then, the watch has been known as the ‘Moonwatch’ and has come to experience worldwide fame. In April 1970, the Speedmaster Professional ended up becoming a life-saver during the mission Apollo 13. When all systems failed due to a fatal explosion on board, this watch was used for navigation. 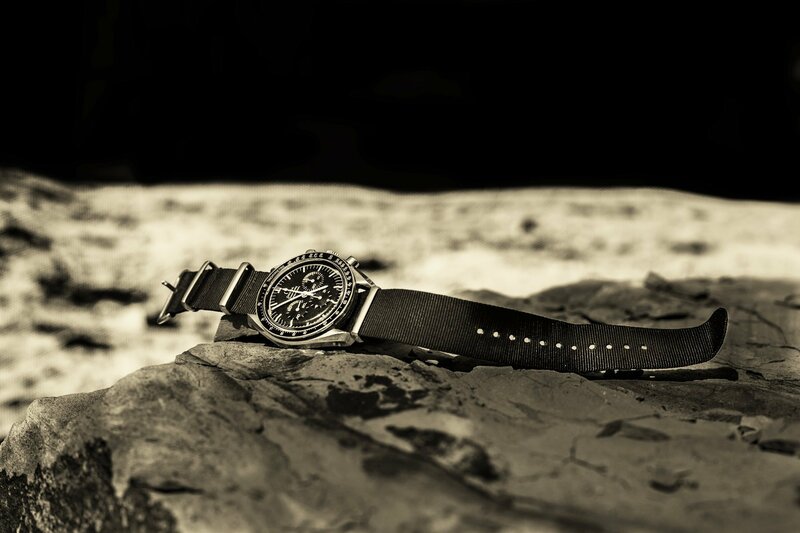 The reliability of the Speedmaster ensured a safe return to Earth. As a result, the watch was awarded the ‘Snoopy Award’ – the highest decoration that is bestowed upon NASA astronauts. Today, the watch is part of standard equipment approved for astronauts and extravehicular activities. The Omega Speedmaster is the most thoroughly tested watch in the world and its reliability is therefore guaranteed. James Bond is the most famous secret agent in the world and has been a style inspiration for several generations. Agent 007 has been sporting an Omega watch on his wrist ever since ‘Goldeneye’ (1995). In the films featuring Pierce Brosnan, the Omega Seamaster Professional 300 M is the model most often seen on screen. Daniel Craig, on the other hand, wore the Omega Planet Ocean 600 M in ‘Casino Royale’ (2006) and the Seamaster Aqua Terra in ‘Skyfall’ (2012). Both watches feature excellent shock resistance and can thus withstand the dangerous tests that they are exposed to by Bond as well as his adversaries. Omega celebrates its longstanding connection with the world of James Bond through dedicated special editions. The Seamaster Planet Ocean 600 M ‘Skyfall’ Limited Edition, recalls the daring adventures of James Bond through a 007 logo at the 7 o’clock marker. The Classic Seamaster Co-Axial 300 M Chronometer James Bond 50th Anniversary represents another impressive tribute to the bold hero. Omega illuminates a sportive and elegant image and enjoys the trust of many distinguished individuals. Elvis Presley, Mikhail Gorbachev, John F. Kennedy, Reinhold Messner, and Michael Schumacher – these impressive names represent a small selection of the brand’s famous clientele. In the world of watches, Omega is one of the greatest pioneers. With the Swatch Group as a strong backing, Omega has been able to achieve true advancements in research and development. In 1999, OMEGA launched the first movement with a co-axial escapement: the calibre 2500. Thanks to the co-axial mechanism invented by George Daniels, there is less friction in the escapement, which in turn, noticeably raises the rate of accuracy and reduces the need for maintenance. In 2007, Omega presented the calibre 8500, a co-axial movement that was manufactured completely in-house. The co-axial escapement is a representation of Omega’s eternal claim to perfection. Today, almost all mechanical Omega watches are equipped with a co-axial escapement. In 2013, Omega once again started a revolution: With the Seamaster Aqua Terra >15,000 Gauss, the company introduced the first ‘anti-magnetic’ watch. In contrast to standard protection against magnetic fields, which is achieved by physically shielding the movement, this new Omega movement is entirely produced from materials that are not affected by magnetic fields whatsoever. Omega now regards anti-magnetism as an essential function of every luxury watch and has planned to gradually equip all watches with magnetic-field resistant movements. Of course, the watches should still be taken off whilst, for example, working in a magnetic field laboratory, but for the less extreme demands of everyday wear, their anti-magnetic properties offer perfect protection. Omega is an undeniable part of dive watch history: In 1932, the company created one of the first diving watches in the world – the Omega Marine. The first Omega Seamaster, launched in 1948, was a product of the wealth of experience that Omega had gathered with military watches and their water resistance function. Therefore, the watch owes its sealed bottom, its innovative O-ring seal, and its automatic movement, among other features, to the vast knowledge and experiences gained by Omega. In 1957, the Seamaster 300 was introduced. Equipped with a rotating bezel, a double crown seal, and a crystal three times as thick as regular glass, it was able to resist water pressure up to 200 metres. In 1970, a collaboration with Jacques Cousteau, the pioneer of marine exploring, culminated in the Seamaster Professional 600. Its nickname ‘Ploprof’ derives from ‘Plongeur Professionnel’ – French for ‘professional diver’. The current 2014 Omega Seamaster 300 model revives the historical dive watch Seamaster 300, by taking inspiration from its design. Omega keeps an expansive archive and knows how to utilize it. Due to its history, the company offers the right choice for innovation enthusiasts as well as collectors of vintage watches. The brand has always been on top in the watch industry and it continuously lives up to its claim of perfection.